Posner, Part II: What Now? Note: After writing this, I read Brad DeLong’s better review of Posner’s book (hat tip Felix Salmon). I won’t be offended if you go read that instead. Part I of my comments on Richard Posner’s epic blog discussed the concept of blame. Today I am going to discuss his approach to some policy questions. Posner’s crisis book is boldly titled “A Failure of Capitalism.” The problem is that when the lens through which you see the world is capitalism – or, more precisely, a flavor of economics that works out to justify capitalism in virtually every instance – it’s not clear what’s left over when capitalism fails. While cramdown would have benefited some homeowners, it would have hurt lenders and thus have undermined the bank bailouts. That’s the whole argument. Filling in the blanks, Posner is saying that because you have decided (a) to bail out banks, you cannot undertake another policy (b) – which may have its own costs and benefits – because it is in some way contrary to policy (a). Apart from creating enormous economic risks, the ambitious long-run proposals are ill timed; by further unsettling the business environment, they will further slow the economic recovery. Leave aside the fact that the “social reform” proposals go unnamed – maybe he means health care – and that the “enormous economic risks” are unexplained. Focus on the second half of that sentence. Posner is saying that policies that create uncertainty for business necessarily impede growth. First off, this is not the situation here. Let’s assume he’s talking about health care or carbon emissions: in both cases, the uncertainty is created by the fact that everyone knows our current non-policies are unsustainable, and therefore it is precisely businesses who want systemic reform. They may not want it in the form Barack Obama wants, but they want to know what the future looks like; that’s why many major carbon emitters are lobbying for cap-and-trade (and free emissions permits), because they want to avoid a carbon tax. Second, even if uncertainty is bad for growth, Posner assumes that the benefits of those policies will not outweigh their costs; there is a tacit assumption that the benefits of government policy can never outweigh their effect on economic growth. Impatience with the [Public-Private Investment Program] leads some economists to advocate the government’s “nationalizing” the weak banks [I assume by this he means FDIC-style takeovers], but that would be a mistake. This is not only because of the manifest inability of the government to manage banks competently, but also because the vexing problem of valuing the overvalued assets cannot be avoided in this way. The banks are not broke; if the government takes them over, it will have to compensate the owners for the net value of the assets that the government takes, including any overvalued assets that, despite being overvalued, have some value. Perhaps what the government could do would be to take (with compensation) all the good assets of the bank, leaving the overvalued ones with the shareholders; then the bank’s balance sheet would be “clean.” But then what would it do with the bank? Run it? Sell it? The practical complications would be immense. First, the “vexing problem of valuing the overvalued assets” does go away. If the government takes over a bank, it can transfer assets from the bank to another entity (the famous “bad bank”) at any price, or no price at all, because there is no one to negotiate with. The government does have to recapitalize the thing that is left over, and the less it “pays” for the assets the more capital it will have to add later; but how much capital the bank requires does not depend on the assets that have been removed from its balance sheet. Even if you accept that the bank in question is not broke, the amount the government might have to compensate shareholders is not the book value of their equity, but the market value – which, for Citigroup, was down in the $20 billion range at one point. Second, and more importantly, Posner simply assumes that government ownership – in any form – is a bad thing. This is in keeping with his legacy. By contrast, though, he is relatively sanguine about the UAW’s retiree benefit trust. Concern has been expressed that, subject to possible modifications by the bankruptcy judge, Chrysler will be controlled by the United Auto Workers and therefore managed inefficiently, as worker-managed firms typically are. But it is not true that the UAW will manage Chrysler. Not the union, but the Chrysler retirement plan, will be a shareholder in the reorganized company (in fact the principal shareholder), and it will have a fiduciary duty to maximize shareholder value rather than to increase the earnings and benefits of the current workers. Posner clearly understands that majority owners are not managers, and that they have fiduciary duties to all shareholders. And he is willing to give the benefit of the doubt to the UAW, of all organizations. The retiree benefit trust he refers to has a board of overseers, slightly under half of whom are nominated by the UAW. But most if not all sensible advocates of bank takeovers recommended selling cleaned-up banks back into the private sector and – if that is not feasible, as would be likely for the big ones – putting the government’s stake in a trust with independent trustees. The “manifest inability of the government to manage banks competently” is just a talking point; no one thinks that pension funds, mutual funds, and life insurance companies can manage banks competently, either, yet no one is bothered by the fact that they are the primary shareholders of most public companies. Once you recognize that free-market answers are not necessarily, unequivocally, always right, then you realize that most interesting questions can be argued one way or the other. And so Posner takes his issues on a case-by-case basis – which ends up being unsatisfying. Take his post on banking regulation, which is full of intelligent thoughts but ultimately no recommendations. Systemic risk regulator? Bad idea, Posner says. It would deter banks from becoming big; he implies that bigness is good, without coming out and saying it – “the result may be a less efficient banking industry, if scale and position in financial markets confer substantial benefits” (emphasis added). And 100 small banks are just as risky as 20 big banks, he asserts. (I think that depends on the risk you are protecting against; it’s hard to see how five little insurance companies could have replicated the damage that AIG caused.) And it would only add to bureaucratic turf wars, because “presumably” the other regulatory agencies would be left in place. The regulators could put a ceiling on the bank’s debt-equity ratio to limit the downside risk. But how would they determine the ratio? And would they impose a ceiling on the debt-equity ratio of all potential lenders? This amounts to saying: (a) if there’s no perfect way to set a leverage cap, there’s no point in bothering; and (b) there’s no point in trying to regulate all institutions that could lend money. Then Posner veers toward the theory that the Community Reinvestment Act, along with Fannie and Freddie, is really to blame. You would think he would agree, since those are forms of government intervention. But he knows that, in fact, the CRA, Fannie, and Freddie were bit players in the subprime debacle, so that can’t be the answer, either. 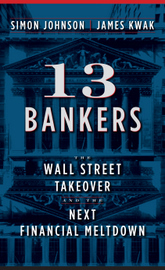 So in the end, Posner’s answer to the question he poses, “How Should the Banking Industry Be Regulated?,” is “not any way that anyone has suggested so far.” It seems that instead of using his talents to defend free-market capitalism, he is using those talents to shoot down any proposal anyone might make as hopelessly naive. Which is unfortunate, because I’m sure he could contribute more to the debate. This entry was posted in Commentary and tagged Banking, regulation. Bookmark the permalink. I’m with you on this one. The only inability truly manifest is that of the current crop of bank managers. I could strangle (metaphorically) anyone who uses the CRA argument. It’s plain propaganda because it fails to explain how CRA in the USA created credit and housing bubbles all over the world. That aside, I think the biggest policy failure we’ve had is to recognize what good things came out of the Great Depression. I mean, we’ve spent some much policy measure on trying to avoid the great depression that we have actually created another mess. If you look at the true failings that created the great depression what you have is too much unproductive lending that went on. Granted a lot of other bad things happened that made the great depression great (i.e. poor monetary and fiscal responses), but in the end those bad debts got washed away by mass bankruptcy and failure. Once we hit bottom the economy grew fast enough so that we eventually made it back to our long term trend line. When we hit bottom now, for the most part the economy will still have a massive amount of unproductive debt on its hands. That can not be good for long term growth. I’m not calling for mass misery of those crisis years 1931-1933, but in the end people got to start over. Now we have policy response that just keeps people treading water. What the Crash of 2008 taught us beyond the shadow of a doubt is the unregulated business will inevitably cave under the weight of greed. I don’t know how you can look at the crash and come out with any different conclusion. Easy money made people act like lunatics. Self-interest trumps sound business practices every time. Long term “social reform” happened under Bush’s watch – the funneling of trillions of dollars to highly profitable financial institutions that had had a terrible multi-year streak of very bad judgment. Leveraged to the hilt, they were on the verge of collapse. Paulson let it be known that trillions of dollars needed to be thrown to bankers without any strings attached – without any oversight – without any punishment for the behaviors that made these bankers so dangerously dependent on a federal bailout for survival. Self-regulation fails every time. It has failed for centuries. The trick is coming up with a regulatory structure that protects the general public without strangling business. That’s something that all the criticisms thrown by Posner won’t do. Sadly, Mr. Posner (and many other conservative commentators) keep running from the central economic thing that needs to happen, and which was a center piece of the Bush Administration’s initial reponse – the removal of “toxic” debt from the balance sheets of banks so that they are free to lend again. I know, I know, I can hear the choruses starting up as to why we’re so far gone not to do it. But the rcession drags on, we pay trillions of dollars to banks to keep them afloat, and they won’t voluntarily divest themselves of their bad debts. They don’t want anyone calling winners and loosers, but we sort of already did that with the supposed stress tests last month. So lets get those toxic clearing houses up and running and get on with it. Otherwise, this economic period will become just as notorious a the GD, and just as fruitless in the long run. The comment seems to agree with many academics that “poor monetary and fiscal responses” worsened the Great Depression. However, just a bit later, it indicates that “hitting bottom” through mass bankruptcy and failure was ultimately a good thing because it wiped out debt and allowed long term growth. These are contradictory. The purpose of a fiscal/monetary response is to prevent mass bankruptcy. The best way to accelerate the “hitting bottom” through mass bankruptcy process is to have monetary rigidity. Which we had in the 30s (and previous panics/depressions), and that resulted in deflation and did not engender a rapid growth response at all. It was the inflationary spending of WWII that ended the Depression. And recoveries from previous depressions were anemic and prolongued. a) renegotiation (which includes taxation and redistribution) – but nobody seems to like this, even when they have an ultimatim as in the case of GM; indeed, creditors have tightened the screws seeking to recover every last penny; the only reason banks _finally_ agreed to a foreclosure moratorium was because the remaining ones had so much market power and they realized that too many foreclosures at once was costing them a lot of money. Renegotiation never seems to work because one of the parties (aka, Chrysler’s creditors) think they can get a better deal in court. b) Inflation – which is going to be the likely outcome. The only question is when, and how much. It could be soon and modest, or take 15 years and be dramatic. Either try to squeeze every last penny from debtors and pay back creditors as much as possible (which will kill the economy, and is likely to harm everyone if it triggers a continuation of the crisis cascade), or use inflation to reduce existing debt (which will drive up interest rates and drive down future investment). The only way to ease this tradeoff is to have an active government that deploys targeted tools and laws rather than vast blunt instruments. However, the assertion that govt. can’t do anything right (and that private businesses are always better) always emerges as the final faith-based argument against government even _trying_ to do anything. [There is a third threat to future growth – structural impairments resulting from decades of bad incentives and debt-like obligations (e.g. entitlement programs). Or, we could impose a 5 year scheduled increase in cap/asset ratios for any bank doing business in the US (which might require some treaty renegotiations), taking the cap/asset ratio from 1/25 (in extreme cases) to 1/10 or 1/8. Then we could compensate for this reduction in the money supply by shifting (a little more) toward a cash based economy by printing money and injecting it into the economy through block grants to states, deficit reduction, and a massive infrastructure investment initiative. While fixing some of our future structural challenges. Of course, that would require an active government. Which, according to Posner et. al., is doomed to destroy the economy. Except in China, where it isn’t. One of the nice things about competition (at the international level) is that if our democratic/capitalist system can’t get its act together, it will eventually be replaced. The “manifest inability of the government to manage banks competently” is just a talking point; no one thinks that pension funds, mutual funds, and life insurance companies can manage banks competently, either, yet no one is bothered by the fact that they are the primary shareholders of most public companies. Unless you understand market fundamentalism as a religion, it is truly impossible to understand how anyone can adduce the alleged incompetence of government as manager as an argument vs. receivership or whatever, since no one could possibly manage big banks and other financial entities worse than the private sector has. At the very worst, the government could be just as bad (but that would be hard to achieve). The truth seems to be that these big structures are not sustainably manageable. They have never lasted long without blowing up. So anyone who believes in evidence would agree that if we want social and economic stability, we simply cannot have large financial structures, period. So when someone like Posner says governments aren’t competent to run banks, but implicitly there does exist someone who is competent, what that really means is that private ownership is theologically being declared “good”, so that reality-based measures like competence are simply irrelevant. To question the competence of the private sector as such is, from this point of view, simple blasphemous insolence. But at the same time, since public ownership (of anything) is ipso facto “bad”, satanic, etc., therefore in this case it is rigorously held to every sort of performance standard. That’s one example of this malevolent religion in action. Another is how tax cuts are considered by definition good and are therefore never held to any performance standard, while any sort of public spending, environmental regulation etc. has its feet held to the fire of “cost-benefit analysis” and so on. I am old enough to remember when people had faith in the gov’t to work, even though there was waste, inefficiency, and corruption. And, in fact, gov’t worked pretty well. I have also seen widespread belief that gov’t is the problem, and, lo and behold, the gov’t has been a problem. I am beginning to think that belief about gov’t effectiveness is a self-fulfilling prophecy. Well, now we have an administration that says, Yes, we can. Will we see a return to effective gov’t? Why does it have to be the same banks? We have given them enough money so that they are still afloat, and even want to return our money. And they want to retain their “legacy” assets. So let them do it. But make clear that they do not get a second bite at the apple. If the banking sector needs further support, the money goes to healthier banks who are next in line. In the long run, can democracy and capitalism coexist? Historically, both democracy and capitalism served to bring royalty and aristocracy down a notch or two or three. But capitalism, by concentrating economic power, which accrues political power, tends to produce its own kind of aristocracy/oligarchy. This was evident by the time of the Robber Barons (note the aristocratic term). Our current political struggle with the big banks is part of that inherent tension between democracy and capitalism. I was going to say that something has to give, and it isn’t democracy. But that is wishful thinking. Perhapse our future is the one envisioned in the movie, “Rollerball”, where the corporations rule, and finally one corporation. Of course, the forms of democracy are likely to persist, just as the Roman Empire retained the Senate, just as 20th century dictatorships and totalitarian regimes styled themselves republics and had supposedly democratic institutions. I have been wondering about a predator-prey analogy, — which is a stretch, to be sure. A simple predator-prey system is cyclic, but predation has benefits for the prey. It tends to keep the prey population fit and healthy. Also, with no predator, the prey population tends to overgraze, eating itself out of house and home, resulting in a reduced population that barely subsists. Now, you may think that I am comparing corporations and big business to the predator and us to the prey, but I am envisioning the regulators as the predators, business as the prey, and us as the grass. Currently we think of regulators as serving both us and business, which is the appropriate role for government servants. It would not do to see the gov’t itself as a predator. This approach cries out for privatization. Why not? If sly businessmen can circumvent government regulators and hire them off, why not have other sly businessmen counteract them? Instead of hiring them off, one tactic of private predatory regulators would be to get hired, so as to infiltrate the target company. :) The fact that their prey would be paying them would help keep the costs of regulation down. Obviously, this approach could not be used for criminal regulation, as information gathered would not be admissible in court. And, of course, corruption is likely, as firms might be willing to pay blackmail and “protection” money. Still, the benefits might outweigh the costs. I’m not advocating policies to bring about mass bankruptcy by any means! I wasn’t intending to sound contradictory; I felt I was stating fact. Bad policy (or the law of unintended consequences) brought about mass deflation and a huge drop in GDP (as you reminded us all of). That led to mass bankruptcy. The mass bankruptcy wiped out the debt. GDP grew 11% in 1934; 9% in 1935 and 13% in 1936. GDP never would have recovered like it did if everyone was left paying mountains of unproductive debt – New Deal or no New Deal. All I was trying to point out is that current policy is looking like bad policy (though others are advocating worse). I’m all for better policy. Something has to be done to correct the debt burdens and I am not 100% sold on inflation being a success – one can create an environment of consumer price inflation, but you cant equally guarantee wage inflation which in this situation is the only inflation that is relevant and helpful. The other option in getting rid of the debt that you forgot was forgiveness (whether it is out of kindness or the hand of the government is a social decision). If you’re a creditor that made bad lending decisions then you deserve to take your lumps. The upside to bankruptcies is that everyone usually leaves the table taking their lumps (again, I’m not advocating this on a mass scale – at least not in an unorganized fashion). As always you’ve hit the proverbial nail on the proverbial head. The issue I have with DeLong’s criticism is his implied assumption of rationality. He doesn’t want to come out and say that individual rationality leads to systemic crisis. And his examples are post factum – DeLong implies that the outcomes were obvious, therefore the actions were *irrational*. But that isn’t the case unless you make the assumption that actors care about systemic risk. Why should they unless the government holds them to task when there is a crisis? They must have thought – rationally – that they would not have to pay the full price if a crisis ensued. And so far they have been correct. The proper argument against the Chicago School is that individual actor rationality does not coincide with systemic stability, indeed that individual rationality will LEAD TO systemic crisis, precisely through ignoring small probabilities. With enough velocity and even with almost infinitesimal probabilities, the POSSIBILITY of a crisis is extremely high. But for any individual actor, the probability of being adversely impacted is low, if sufficiently shielded from the system. What is the government currently doing if not shielding actors from the system? I wonder how the “bad” actors figured out what the government was going to do? The people who need to start acting rationally are in the government – they need to allocate losses as the people who elected them expected – and step in and perform the functions of the financial system (albeit less efficiently) while the financial system changes its own culture. Somewhere in there, there’s a good paper on bankruptcy, inflation, interest rates, punishment of bad actors, and optimal renegotiation of punishment threats. The tradeoff between using self-inflicted harm to punish bad actors and rewarding bad actors to prevent social meltdown is irreconciliable without giving govt. better ability to target action. For those who despise government, the tradeoff is stark and brutal – either bail them out or endure a brutal depression. The argument – a la Posner – that govt. can’t fix it cause govt. broke it – is patently absurd. It wasn’t _this_ govt. that broke it. And it was largely govt. INaction that helped break it. Federal agencies – perhaps the Fed, perhaps others – need a few more scalpels now that the “crisis” phase has faded. As to bankruptcy as a good method of mass debt reduction (not that you are arguing this, but others have), 1934’s growth was from a rather low base. A lot of it reflected an increase in capacity utilization of existing infrastructure. I suppose the above also explains why Posner was long on criticizing the current response, but short on providing solutions. Because without a govt. that displays some modicum of competency and integrity (and hence can target specific problem areas rather than firing off nukes), Posner ain’t got nothin’ to play with. Well spoken anne. The predatorclass ‘government-is-bad’ talking point only applies to government involvement in industry and social safetynets. Government-is-good for the predatorclass however when policing the peoples lives as in enforcing wingnut evangelical false religious moralities on the people, erecting and maintaining the largest prison system on earth, (and a privatized prison system at that), hunting down and deporting immigrants, spying on Americans carte blanc sans the 4th Amendment, and hurling Amerika’s daughters and sons wars of choice and wanton profiteering. Then majikally the gospel according to the predator proclaims biggovernment-is-good. From my perspective the role of government should be exactly opposite. As mentioned in previous posts and eloquently articulated by anne and others above is that: “What the Crash of 2008 taught us beyond the shadow of a doubt is the unregulated business will inevitably cave under the weight of greed…. Easy money made people act like lunatics. Self-interest trumps sound business practices every time”, and for me the reality is more grim – that unregulated industry and unrestrained predatorclass operators ALWAYS resort to abusive, criminal conduct and the systemic capture, or purchasing of, and hence control of the government. No where in any of these arguments is their any concern for the plight, or the pain and suffering of the poor and middle class. Perhaps it is an impossible dream, but I do not see any hope of America rebounding in any significant way until the nation evolves into a manufacturing based economy. An economy based on irredeemable debt is a PONZI scheme certain to collapse and fail, even though a few select predatorclass cronies may benefit wantonly in and from the nefarious process. Investing in infrastructure, green technologies and the green future, modernizing our existing or crumbling manufacturing bases, upgrading or completely revamping our electrical grid, constructing a high tech (meglev, or supertrain) railsystem, focusing on education with forced funding priorities directed at students and the class rooms, and subtracted from the strangling bureaucracy of consultants and socalled administrators, and enforcing and abiding by THE RULE OF LAW – in short applying the bulk of the energy and priorities and directing the lions share of capital and funds of the government toward the best interests of America’s poor and middle class is the best and only way to reconcile democracy with capitalism. Government should serve, protect, and advance the peoples best interests, – NOT the interests of industry or the predator class. The predatorclass will be just anyway, and needs no special favoritism or extraordinary advantage, or largess from the government. That way leads to oligarchy and ruin!!! I’m not at all sure that Posner qualifies as a conservative. He’s not wrapping himself in the mantle of Burke nor making reference to some golden bygone era to which we should return. I think Posner is a reactionary as well, as another commentator pointed out, a true believer in the market. Albert Hirschman, in a lovely short book called the Rhetoric of Reaction, identified three kinds of reactionary thought (I can’t remember his exact phrases): perversity thesis, unintended consequences, and something like stasis. The first claims that any attempt at remediation will produce the opposite of what is intended-a perverse consequence; the second, that any benefit of a proposed course of action (policy) will be outweighed by unintended (and probably harmful) consequences; the third argues that while doing something may be appropriate, now is not the right time. It seems to me that Posner ( perhaps as an index of his intellectual prowess) qualifies for all three. I am a bit troubled that the most of the comments to most of the posts on the blog are starting to sound like an AMEN corner of government interventionists. 1. Governments have no incentive to compete on cost. Inefficiencies and political exigencies reign supreme. 2.Governments are not exposed to the same risks as businesses. They have (especially the US) a virtually unlimited source of funding either through taxes, borrowing or printing money. That is the core problem with having the govt participate in the medical insurance market. Since they have no risk they can undercut all other competitors on the revenue side. In the case of medical insurance you can end up with inefficencies on both sides: Not enough revenue coming in coupled with too much spending going out…. …wait a minute… that is exactly what we do have in Medicare today. nuff said. But with the current system, we have private insurers writing all the profitable insurance, and the government is left with providing health care to people who cannot be insured profitably. In that sense, the example of Medicare is irrelevant to a large degree. Private and government health care systems each have their flaws and benefits. There is incredible waste an inefficiency in the current system, so simply showing that there will be more of the same in a government-run system is not a sufficient argument for its dismissal. In fact, proving that government health care would be more costly would not necessarily be sufficient either. Unlike the economics of consumer electronics or cars, health care policy is and always has been driven by moral issues, and those have to be accounted for. The equitable distribution and access of health care is, in reality, something that must be considered. Your argument, however, seems more valid in the context of the financial industry. But moral issues abound here as well. Easy money makes people act like lunatics, so they must be regulated more closely? Why not just stop the easy money? What industry was is more highly regulated than banking, maybe airlines? This guy makes no sense and I wonder why he takes up so much space on this blog. How can all the players be rational but the game irrational? How was AIG rational?? A low level bookie could have run that company with better risk controls. I agree on having divergent views expressed here but seriouly…enough Posner. This is a fascinating article. Posner is just another of the “talking heads” who like to say “no,” but offer no meaningful solutions. Geithner has already screwed us by continuing to prop up the oligarchs, and Posner is saying “just don’t further screw things up with neferious regulation. Unfortunately, Geither has suggested little, really, and the Congress (handmaidens of the oligarchs) only operate on the fringes (no big bonuses to TARP recipients). God save us from the Posners. Thanks, James!!! I have to agree that Posner is no Burke. I actually just got the Posner book (oddly, my reading group is halfway through Burke’s “Reflections on the French Revolution”) and I am looking forward to reading Posner’s book for what it is. I’d read the review of Posner’s book in May in The New York Review of Books, and was intrigued by the idea that he was apparently changing his perspective on regulation. Richard Posner is new to me. I’ve attempted to read Posner I and Posner II. I am inclined to quip: Posner is an apologist for a failed ideology that — in a worse case scenario — could trigger a global depression. I just saw Richard Posner on Charlie Rose selling (won’t use the w verb) his new book. I’m not very impressed. The guy is writing a book about the current crisis, and what is his answer to the BIGGEST CAUSE OF THE CRISIS, THE REPEAL OF THE GLASS-STEAGALL ACT , AND LACK OF REGULATIONS AND LACK OF TRANSPARENCY IN THE DERIVATIVES MARKET??? Apparently he thinks we should fart around, hem and haw until everyone just forgets and the banks can go back to business as usual. No, those sweeties at the banks won’t cause another bubble to happen again over the next few months….no hurry. Good answer Mr. Posner. You’re a true American Patriot. Mr. Posner, would you please say “Hello” to your good friends Montgomery Burns and Scrooge at tee time tomorrow for me please??? The main reason of rising bond yield is the higher government budget deficit and debt and FED’s quantitative easing. And we are all known that we are going to face the risk of high inflation or hyperinflation because the action of policy makers create the inflation expectations and we are already seen them. If you look at current price data, core CPI and Core PCE increase for 4 months at accelerating rate, unit labor cost increases by 5% in the last quarter. Oil price increases by 100% in 4 months. The CPI data for May will show the jump in CPI and the inflation expectation data will also show the jump. Furthermore, if oil price stay at 70-100 USD/barrel, we could see the inflation at 15% in Q409 and Q110. Why don’t we see two digits 10-year bond yield? But we will rather face the declining growth (especially employment) and rising price because the policy makers create the wrong policy and wrong signal to the private sectors. Clearly, all speculators jump to invest in oil and short government bond because if we face the bad economy, government will have more budget deficit and FED will print more money; surely, the all business and consumer will not expect the lower inflation. That means the higher inflation in the future or the higher long bond yield. The more liquidity by FED also support the speculation in oil price. However, we could not see the actual real growth because the unadjusted price by policy markers. The business prefer the lower employment to use monopoly policy rather than use full capacity because we are all known that the consumption will be lower; therefore, the producers rather choose to sustain their profit margin than expand production to get lower margin. Therefore, the wrong policy will create producers’ monopoly policy meaning the lower production and higher price. It would be better if policy makers decide to build the expectation of 1) low and stable price; meaning that if there is no way to create the monopoly policy and we could see the growth along with price; higher growth and higher price. Now speculators should have 2 pair trades: long US dollar and short government bond and long oil and short stocks because we are facing the rising inflation and interest rate that will kill the economy. That means we could face the false expectation in the stock price that depend on the real growth but we could face only inflation. We should also short bond yield from the rising inflation and long Us dollar from the benefit of the rising yield. I think FED and US government should change the policy suddenly before those policies kill us all dead. I just learned for Ph.D. class in development economics on the growth strategies written by Prof. Rodrik that no short term policy that is successful to drive the growth sustainably and there is only long term policy can improve the economy. I agree the unorthodox policy but printing money to monetize debts is not good unorthodox policy but it will create the economic disaster. Because we will face only high inflation with growth or the growth depression with hyperinflation. Now the only thing I see is that government use concept of privatizing the gain and socializing the loss for the private but all subsequent debts and inflation will be the burden of the next generation and surely next generation will live with the high cost of living and a lot of tax payment for the debts. I think this month we will see 4.5% ten year bond yield at least and two digits in this year. The only way to stop this trend is to stop wrong policy. FED should stop QE program and start to increase the interest rate to stop speculation and build the low inflation expectation. The government should increase tax on the rich, tax on the gain on oversea investment both hard and financial assets and increase excise or import tax to improve the trade balance. That sounds workable. I’m betting it can be demonstrated rigorouly (in the mathematical/economics sense), but finding historical precedent might be difficult. There are a lot of behaviours that would undermine such a policy, beginning with levering a balance sheet with other people’s money so that your own return on your wafter-thin sliver of equity is greatly magnified. This is a question as much as a comment. How is that savings rate calculated? Up until about the late 1970’s, anyone who wanted to save put their money in a savings account at the local bank. Then every financial advisor in the country started telling us that we would never be able to retire on what we could set aside in our savings accounts. We were all instructed to open an IRA or a 401K. That’s exactly what millions of US citizens did, all thinking they had sound advice. A guy like me can’t afford to have both an IRA and a healthy savings account, so I shorted the savings account, as did millions of others like me. Now, after being told for decades that I needed to invest my dollars set aside for retirement, I’m being told I screwed up by not saving enough. Well, how is the national savings rate calculated? Is it by what’s in savings accounts and T-bills, or does it include all the money people put into IRAs and 401Ks? Please, I need an answer on this. Great post. Hope you get your answers. I’d like to know too. Todd Sullivan is the guy that wrote the article in the link above. I don’t know who Todd is, but in his explanation of how the savings rate is calculated, it sounds like IRA’s and 401-K’s are not counted as savings. I sure as hell count it as savings, and I have a hard time seeing how a real economist could not count it as savings. There are comments after the Todd Sullivan explanation of savings that shed a little more light on the subject, but it’s still not real clear to me why I should believe anyone who says low US savings are partly to blame for the current meltdown. A statement like that makes no sense to me. I don’t get it. I’m a construction worker; maybe wearing a hardhat all day makes me stupid.